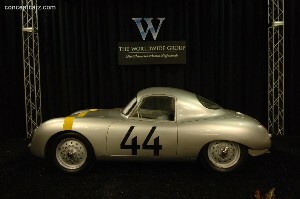 The Worldwide Group, an Indiana based company which specializes in auctioning significant automobiles, partnered with the Hilton Head Concours d'Elegance & Motoring Festival for the Hilton Head Auction which took place on the day prior to the Concours. Vanagel pointed out that Rod Egan, a Worldwide Group Principal, has handled and operated some of the largest auctions and collections in North America. He has the unique experience of having sold over $3 billion both privately and through auction, placing him in an elite group of few auctioneers who have handled major asset conversions at that level. Widely respected for his appraisal and sales ability, Rod Egan has helped close some of the largest private car collection sales in North America in recent years. Of the nearly 100 vehicles offered for auction, there was a very diverse group ranging from pre-World War II American masterpieces, to muscle cars, to European performance, and more. The cars that were expected to bring in the highest sales were the Glockler Porsche, 1954 Chevrolet Roadster, Alfa Romeo Giulia TZ1, Dodge Challenger 440 R/T Convertible, Shelby GT500-KR, Packard 1101 Convertible Coupe, 1969 Shelby GT350 Hertz, 1938 Mercedes-Benz 540K with coachwork by Vanden Plas, 1932 Chrysler CL Imperial Dual Windshield Phaeton, Cord L-29 - to name a few. The list goes on. All were expected to sell over $100,000. The Alfa Romeo Giulia TZ, with a lightweight aluminum body designed by Zagato, was sold for an impressive $379,500. The 1938 Mercedes-Benz 540K was estimated to sell between $800,000-$950,000. It has a one-of-a-kind body with coachwork by Vanden Plas. Though there was interest in the vehicle at the auction, the highest bid failed to meet the reserve and the vehicle was left unsold. The carefully orchestrated event proceeded for a number of hours with each vehicle given their turn to roll across the auction platform. Most traveled under their own power, but a few required a good push. Though not every vehicle was sold, each vehicle was bid upon. There was often a short introduction about the vehicle, its history, or the history of the model, followed by the opening of the auction. If there was little interest in the vehicle, the auctioneers would begin talking about the highlights of the car or the pleasure it could bring its new owner. 'Don't let this opportunity pass you by' was a common theme and one that was very true. From the beginning, nearly ever seat in the audience was full. In the back there was limited 'standing room only' which was full the entire day. For many, this was more than just an auction - it was entertainment. The day of the auction was the same day the Car Clubs had graced the beautiful lawn of Honey Horn, another activity of the Hilton Head Concours. The walk from the car club display to the auction took only a few minutes which added an extra bonus for onlookers. The oldest vehicle of the day was the 1916 Ford Speedster. It was also the 'charity' vehicle with all proceeds from the sale going to charity. The sale from the vehicle netted $8,800. The 1969 Chevrolet Chevelle was judged one of the 50 best muscle cars in the country at the September Super Car Reunion #7 in Collinsville, Illinois. It is one of just 17 Chevelle's known to exist with the L-72 COPO option. The Chevelle's carried no badges or logos which meant it was the ultimate 'sleeper car.' When an unsuspecting motorist would challenge the Chevelle to a race, they were in for a surprise when the 425 horsepower monstrous engine was unleashed. COPO options are very rare and surprisingly, this was not the only COPO optioned car of the day. A 1969 Chevrolet Camaro ZL-1 All-Aluminum 427 Coupe was also offered for sale. It is the ninth sequential COPO Code 9560 produced. It is one of 69 all-aluminum ZL-1 Camaro's ever produced. These engines had originally been created for the CanAm Series. The Fred Gibb Chevrolet dealership convinced General Motors to install a few of the engines into the Camaro. At auction, both of these cars, the '69 Chevelle and the '69 Camaro, were left unsold. The 1970 Plymouth 440-6 Pack Cuda and the 1970 Dodge 440-6 Pack SuperBee were sold from the same stable. They both were finished in Plum Crazy paint and outfitted with the same 440 cubic-inch V8 that produced 390 horsepower. Both were offered without reserve with the Plymouth expected to sell for more, estimated between $140,000-$180,000. At the conclusion of the bidding, the Plymouth had sold for $120,450 while the Dodge SuperBee fetched $88,000. The 1970 Dodge Challenger 440 R/T Convertible is the highest optioned E-body big block known to exist. It is one of just 163 built and one of 44 known to exist. At auction it was expected to sell between $250,000-$325,000. When the gavel struck the podium the vehicle had been sold for $159,500. A 1964 Pontiac GTO with a 389 cubic-inch V8 rated at 325 horsepower was expected to fetch between $75,000-$100,000. It has traveled 17,173 miles since new and has spent most of its days in a garage, making it one of the lowest mileage, original, unrestored '64 GTOs in existence. At auction, the new owner got a bargain buying the vehicle for $53,900. There were three Porsche 356 SC Coupes, one of which was a Sunroof Coupe. 1965 was the final year for the 356 before being replaced with the 901/911. The 1964 Porsche 356 SC Sunroof Coupe captured the highest price of the 356 SCs being offered, selling for $39,600. There were nine Mustangs offered for sale five of which were Shelby Mustangs. The line-up included a BOSS 302, BOSS 429, four GT350 with one being a Hertz, and a GT500KR. The Mustang BOOSS 429 was estimated to sell between $250,000-$300,000. The same figure was estimated for the Shelby GT500-KR. The Mustang anticipated to fetch the most at auction was the 1967 Shelby GT350 finished in Wimbledon White with two Guardsman Blue racing stripes. It had an estimated value of $350,000-$400,000. It was one of the first one hundred Mustang GT fastbacks that shipped directly from Ford to Shelby's Venice, California facility to satisfy the SCCA requirements. It is serial number 41 and is one of the oldest surviving Shelby Mustangs in modern times. Of the nine Mustangs that were offered, only one was sold. There were interest in others, but reserve kept them from finding a new owner. The Polo White 1954 Chevrolet Corvette offered is believed to be the lowest mileage 1953-1955 Corvette in existence. On auction day it was sold for $269,500. One of the most 'anticipated' sales of the day may have been the 1976 Chevrolet Vega Kammback Estate Wagon. It was expected to sell between $10,000-$15,000. The auctioneer encouraged people that buying this vehicle would surly mean a fuel friendly vehicle that would be dependable and reliable for its owner. It was hard to focus on the positives as the history of this vehicle plagued one's mind. It is included on Forbe's Magazine list for being one of the worst cars of all time. Even with the vehicle problems and rusting issues, there were over two million examples sold during its production lifespan which should help boast for the vehicles popularity and practicality. On auction day, the Vega Kammback Estate Wagon was offered without reserve and did find a buyer, though it did not come anywhere near the estimated value, selling at $2,200. There were many surprising sales and one of them was the 1987 Rolls-Royce Silver Spur. When first sold in 1987, it demanded nearly $120,000. Fast-forward almost twenty-years and the vehicle was expected to sell between $20,000-$30,000. It was one of the few vehicles of the day to be offered without reserve. Bidding hovered around $10,000 while the auctioneer tried to convince the audience that the new owner would have instant social status wherever they traveled and that the Rolls-Royce has long been regarded as 'The world's best motorcar.' Bidding reached a pinnacle at $15,000 and the vehicle had found a new owner. The Worldwide Group is a service oriented company that also handles appraisals, collection management and acquisitions, tax and estate planning, real estate properties and private treaty sales. For more information, visit www.theWWG.com. What a difference a year makes! The Hilton Head Concours d'Elegance has continued to improve the weekend activities, including the auction. Enough good things cannot be said for the wonderful job that was performed by the Worldwide Group Auctioneers. This was their first year to the Hilton Head Concours and they brought with them improvements in all facets over the prior years; the facilities that housed the auction and the cars were very impressive. The nearly 100 vehicles offered for sale were top-notch and attracted buyers of all tastes, showing their approval by purchasing over half of the vehicles. The event was well orchestrated, enjoyable and very entertaining. They have set the bar very high - we can't wait to see what they have planned for next year.